When Simone Di Matteo first saw the patterns in his data, it seemed too good to be true. "It's too perfect!" Di Matteo, a space physics Ph.D. student at the University of L'Aquila in Italy, recalled thinking. "It can't be real." And it wasn't, he'd soon find out. Di Matteo was looking for long trains of massive blobs—like a lava lamp's otherworldly bubbles, but anywhere from 50 to 500 times the size of Earth—in the solar wind. The solar wind, whose origins aren't yet fully understood, is the stream of charged particles that blows constantly from the Sun. Earth's magnetic field, called the magnetosphere, shields our planet from the brunt of its radiation. But when giant blobs of solar wind collide with the magnetosphere, they can trigger disturbances there that interfere with satellites and everyday communications signals. In his search, Di Matteo was re-examining archival data from the two German-NASA Helios spacecraft, which launched in 1974 and 1976 to study the Sun. But this was 45-year-old data he'd never worked with before. The flawless, wave-like patterns he initially found hinted that something was leading him astray. It wasn't until uncovering and removing those false patterns that Di Matteo found exactly what he was looking for: dotted trails of blobs that oozed from the Sun every 90 minutes or so. The scientists published their findings in JGR Space Physics on Feb. 21, 2019. They think the blobs could shed light on the solar wind's beginnings. Whatever process sends the solar wind out from the Sun must leave signatures on the blobs themselves. Di Matteo's research was the start of a project NASA scientists undertook in anticipation of the first data from NASA's Parker Solar Probe mission, which launched in 2018. Over the next seven years, Parker will fly through unexplored territory, soaring as close as 4 million miles from the Sun. 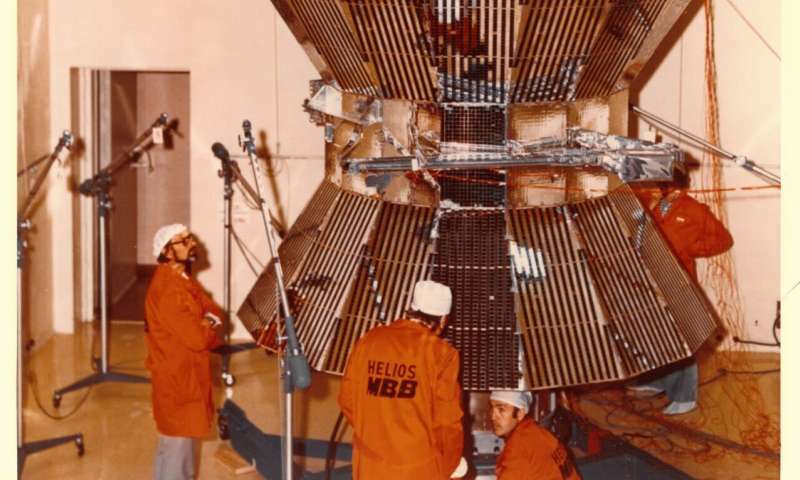 Before Parker, the Helios 2 satellite held the record for the closest approach to the Sun at 27 million miles, and scientists thought it might give them an idea of what to expect. "When a mission like Parker is going to see things no one has seen before, just a hint of what could be observed is really helpful," Di Matteo said. The problem with studying the solar wind from Earth is distance. In the time it takes the solar wind to race across the 93 million miles between us and the Sun, important clues to the wind's origins—like temperature and density—fade. "You're constantly asking yourself, 'How much of what I'm seeing here is because of evolution over four days in transit, and how much came straight from the Sun?'" said solar scientist Nicholeen Viall, who advised Di Matteo during his research at NASA's Goddard Space Flight Center in Greenbelt, Maryland. Helios data—some of which was collected at just one-third the distance between the Sun and Earth—could help them begin to answer these questions. The first step was tracing Helios' measurements of the blobs to their source on the Sun. "You can look at spacecraft data all you want, but if you can connect it back to where it came from on the Sun, it tells a more complete story," said Samantha Wallace, one of the study collaborators and a physics Ph.D. student at the University of New Mexico in Albuquerque. Wallace used an advanced solar wind model to link magnetic maps of the solar surface to Helios' observations, a tricky task since computer languages and data conventions have changed greatly since Helios' days. Now, the researchers could see what sorts of regions on the Sun were likely to bud into blobs of solar wind. Then, Di Matteo searched the data for specific wave patterns. They expected conditions to alternate—hot and dense, then cold and tenuous—as individual blobs engulfed the spacecraft and moved on, in a long line. The picture-perfect patterns Di Matteo first found worried him. "That was a red flag," Viall said. "The actual solar wind doesn't have such precise, clean periodicities. Usually when you get such a precise frequency, it means some instrument effect is going on." Maybe there was some element of the instrument design they weren't considering, and it was imparting effects that had to be separated from true solar wind patterns. Many Google searches and a weekend of online translators later, Di Matteo unearthed a German instruction manual that describes the instruments dedicated to the mission's solar wind experiment. Decades ago, when Helios was merely a blueprint and before anyone ever launched a spacecraft to the Sun, scientists didn't know how best to measure the solar wind. To prepare themselves for different scenarios, Di Matteo learned, they equipped the probes with two different instruments that would each measure certain solar wind properties in their own way. This was the culprit responsible for Di Matteo's perfect waves: the spacecraft itself, as it alternated between two instruments. After they removed segments of data taken during routine instrument-switching, the researchers looked again for the blobs. This time, they found them. The team describes five instances that Helios happened to catch trains of blobs. While scientists have spotted these blobs from Earth before, this is the first time they've studied them this close to the Sun, and with this level of detail. They outline the first conclusive evidence that the blobs are hotter and denser than the typical solar wind. Whether blob trains bubble in 90-minute intervals continuously or in spurts, and how much they vary between themselves, is still a mystery. "This is one of those studies that brought up more questions than we answered, but that's perfect for Parker Solar Probe," Viall said. Parker Solar Probe aims to study the Sun up close, seeking answers to basic questions about the solar wind. "This is going to be very helpful," said Aleida Higginson, the mission's deputy project scientist at Johns Hopkins University Applied Physics Laboratory in Laurel, Maryland. "If you want to even begin to understand things you've never seen before, you need to know what we've measured before and have a solid scientific interpretation for it." Parker Solar Probe performs its second solar flyby on April 4, which brings it 15 million miles from the Sun—already cutting Helios 2's record distance in half. The researchers are eager to see if blobs show up in Parker's observations. Eventually, the spacecraft will get so close it could catch blobs right after they've formed, fresh out of the Sun. Mining new results from four-decade old space probe data is an impressive accomplishment! It makes me wonder what new discoveries may still be lurking in old astronomical photographic plates.